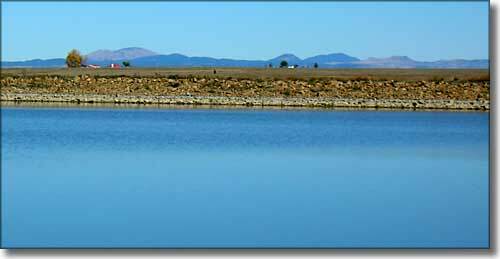 Springer Lake is a fishing lake leased by the New Mexico Department of Fish and Game. It's about four miles west of town, past the New Mexico Boys School (which is apparently now part of the New Mexico Department of Corrections and isn't necessarily a "Boy's School" any more). I'm told the fishing is good, but the facilities are somewhat neglected and the road to the boat ramp is pretty beat. The picnic area and around the restrooms was so overgrown with weeds as to be unusable. And the number of empty beer cans and broken bottles laying around was a testament to the ability of a few local fishermen's ability to hold their own when under direct frontal asault from a truckload of twelve-packs. But there were lots of ducks on the water and the views were great.